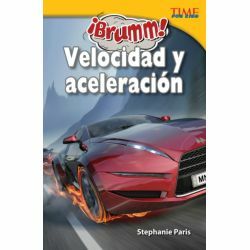 Accelerate through the pages of this book and introduce readers to physics and how it assists objects to move. This stimulating, Spanish-translated nonfiction title includes real-life examples and basic experiments to facilitate further understanding of physics. Readers will learn about velocity, Newton's Second Law of Motion, thrust, gravity, momentum, and g-force through vibrant and colorful images, fascinating facts in conjunction with informational text, accommodating graphs and diagrams.